IN just two years the Battle of Zimbabwe has lost half the number of fans who paid to watch this epic contest in yet another graphic illustration of the way the domestic Premiership is losing its fight to stop supporters drifting away. Official figures for last year’s match, when DeMbare were still housed at Rufaro, were not readily available last night, but Sunday’s turnout at the National Sports Stadium represented a drop by more than half, in terms of the fans, who came to watch the flagship tie between Dynamos and Highlanders in Harare in 2012. The two giants are the country’s biggest football clubs although, in a season where CAPS United are very competitive, the Harare Derby between the Green Machine and DeMbare has a bigger crowd pulling power. Two years ago, 28 886 fans packed Rufaro to watch the Battle of Zimbabwe and the big match grossed US$168 000. The attendance figures from Sunday’s match show that this game even attracted fewer fans than those who watched these giants battle it out at Barbourfields in the last two seasons. Last year 16 508 fans paid to watch the big match in Bulawayo and there was an even bigger crowd, the previous season, when 25 957 fans thronged Barbourfields in 2012. But only 13 292 fans paid to watch the Battle of Zimbabwe on Sunday, representing a sharp decline in attendance figures for a match of this magnitude. Champions Dynamos might have recorded yet another victory over Highlanders to maintain a proud eight-year dominance, but the Glamour Boys should have been left worried by the poor attendance. Statistics from the Premier Soccer League office revealed that the match attracted probably the lowest crowd in matches between the two giants in recent years. Organisers attributed the drop to the tough economic environment currently prevailing in the country and partly to the World Cup tournament in Brazil which has somehow stolen the limelight from the local games despite the time differences. The high quality of matches at the World Cup has exposed fans to football at another level and for some, a return to the domestic Premiership, where the standards have also plunged this year and which is terribly short on superstars, has been an inconvenience. Dynamos grossed just US$41 426 on Sunday, which represents a huge decline in terms of earnings from gate receipts for a match of this magnitude which, only two years ago, was grossing US$168 000. Although the net income could not be ascertained, the Harare giants were expected to remain with far much less as the figure obviously dropped further after paying off levies and all the services providers. The cheapest ticket was pegged at US$3, which was slightly lower than the US$5 charged two years ago when the Battle of Zimbabwe witnessed a record crowd at Rufaro. Dynamos captain Murape Murape says their victory over Highlanders should provide the tonic they need in their fight to retain the Premiership crown as they face a tight competition in the race this year. The Harare giants climbed to third place on the log standings courtesy of a 1-0 win over Highlanders and are level on 22 points with leaders Hwange and How Mine. Washington Pakamisa scored the only goal of the match, a beauty after 34 minutes, to hand Highlanders their first defeat this season. Crucially, Dynamos have not lost a match to their traditional rivals since 2006 and the win maintained an eight year dominance. However, Murape said the Glamour Boys should not be carried away as they still have a long season ahead of them. While beating Highlanders is always one of their priorities every season, Murape senses that their crown is under threat from different corners. Competition looks tough this season as the current top seven teams are only separated by three points after 12 games. “We have to remain focused and the attitude has to be correct no matter which team we face. Of course, we have managed to maintain the record against Highlanders but we can only be champions at the end of the season. “We have not yet landed the 2014 championship yet. “If you look at the log table, it’s very tightly contested at the top where about five or six teams are only separated by two points. It shows how competitive the league is this season hence we need to be winning consistently. “It may be early to talk about winning the championship, but my wish this year is to land another title and we have to do it convincingly. “The previous years we have had to wait until the last day but this time if we are to win it again we should do it with two or three games remaining,” said Murape. Dynamos have experienced mixed fortunes in the current campaign and had suffered a 1-0 defeat at Hwange before the big game. The Harare giants have had to handle lot of pressure and criticism as defending champions for their insipid performances on the pitch but to their credit, Callisto Pasuwa’s men have managed to collect points with regularity. DeMbare will travel to Bulawayo for a date against Chicken Inn in their next assignment. “Of course we are getting too much criticism, it’s coming from everywhere and because we are Dynamos we have to expect that. “It’s nothing new, we are the champions, we have the biggest support base and in the diversity of the fans everyone has his own views. “What is important then is the character and attitude and how we respond to that as players because some of the criticism sometimes is unwarranted. “Constructive criticism is good and we are glad to accept it because without criticism we cannot achieve anything. “We have many fans out there who are used to seeing their team win and watch exciting football but sometimes patience is needed on the part of the supporters. “Teams go through different phases in football and there are times when we need them the most especially when chips are down. They were excellent on Sunday,” said Murape. 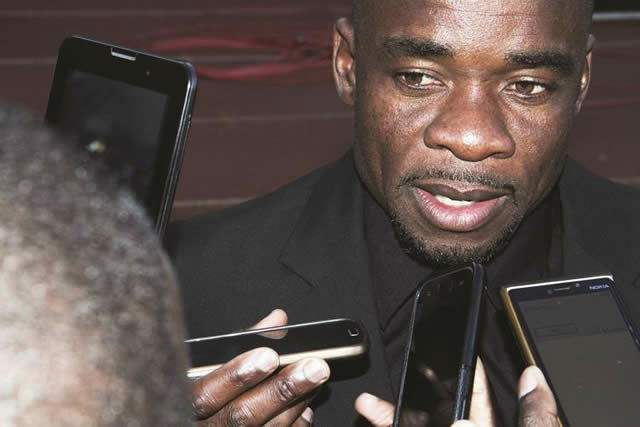 Highlanders coach Kelvin Kaindu was naturally upset with the defeat especially after seeing his team getting off to a good start this season to maintain their unbeaten run to 11 games. When putting form into context, this was probably the best chance for Highlanders to end the jinx against their old foes. “It was a game we played quite to the expectations. I think it was supposed to be more explosive but we lacked character. “However, in the second half we showed a bit of improvement when we made those changes in terms of trying to penetrate the Dynamos defence. “I think we lost the game in attacking because we were out of position,” said Kaindu. Boos rang out from the Bosso fans at the giant stadium when Kaindu pulled out Kuda Mahachi although his replacement Valentine Ndaba did more in 20 minutes than what the CHAN poster boy did in 70 minutes.